...a bizarre Theory of Relativity. The 23. of Iuly they tooke a sorrowfull farewell of vs, but being loathe to leaue vs, they presently ranne to the tops of the hils to keepe vs in their sight as long as they could, making fires before and behind, and on each side of them, burning therein (as is to be supposed) sacrifices at our departure. Not farre without this harborough did lye certaine Ilands (we called them the Ilands of Saint Iames) hauing on them plentifull and great store of Seales and birds, with one of which wee fell July 24. whereon we found such prouision as might competently serve our turne for a while. We departed againe the day next following, viz. July 25. And our Generall now considering, that the extremity of the cold not only continued but increased, the Sunne being gone farther from vs, and that the wind blowing still (as it did at first) from the Northwest, cut off all hope of finding a passage through these Northerne parts, thought it necessarie to loose no time; and therefore with generall consent of all, bent his course directly to runne with the Ilands of the Moluccas. 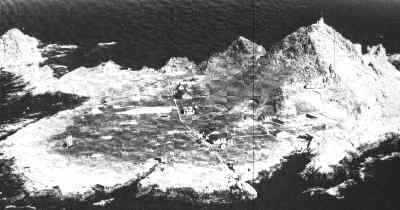 It is the Guild's belief that these dates resulted from the usual seamen's practice in that era to change the log date at noon instead of midnight.... Drake could have left Drake's Estero the morning of August [sic] 23, commenced his sea day at noon with the new date of August [sic] 24, and reached the Farallon Islands before dark. ...ranne to the tops of the hils to keepe vs in their sight as long as they could. ...the wind blowing still (as it did at first) from the Northwest. It happens that the Farallons lie almost due south of Drakes Bay, so the northwest wind would not have forced the Golden Hind into lengthy tacking maneuvers; on a straight course to the Farallons, she would have had the wind nicely on her rear quarter. There is no reasonable mechanical explanation for the delay, and that leaves the patriots of Drakes Bay in a very awkward position. The "Guild's belief" in the solution to the dilemma - the noon-to-noon datekeeping - is vulnerable to several general objections. Aker's assertion that a noon change of date was "usual seamen's practice in that era" does not consider that Francis Fletcher, the probable source by nearly everyone's reckoning of the information under discussion, was a preacher, not a professional sailor. Noon date changes seem to be found only in ships' logs, not in the sort of on-board journals and notes kept during voyages by unofficial observers such as Fletcher. This has been pointed out, with supporting evidence, by the late Robert Power (always a thorn in the Guild's side) but heretofore no attempt seems to have been made to determine the validity of this counter- argument as it applies to the specific case of the World Encompassed. In a reasoned discussion Power's logic might settle the matter of when the calendar pages were flipped, but reason is something not often found in debates about Drake, particularly when preposterous pet theories are threatened. Neither simple logic nor indirect evidence of what was done on other ships can prove beyond doubt that the dates as related in the World Encompassed were changed at midnight. At Lima we arrived Febr. 15 ... we entred and anchored all night in the middest of them.... The very next day ... in the morning (viz. the 16. of the said moneth) wee set sayle. Here the implication that the date was not changed at noon is strong. For a noon date change to fit here, the Golden Hind would have had to arrive before noon (on the fifteenth), unnoticed in or near this populated enemy harbor. But again, there is nothing in the text alone to corroborate the obvious - that the Golden Hind arrived after dark. However, when this investigation was expanded to include Spanish records of Drake's activities in the Pacific, and when these were compared to the reports from the World Encompassed, the picture changed dramatically and, for the Drake Navigators Guild, catastrophically. ...between ten o'clock and midnight, the ship of some English Corsairs, with a pinnace and skiff arrived at the port of Callao de Lima. so held on their course towards Calao de Lyma, where they entred, being about two or three hours within night. Thus the post-noon arrival of the Golden Hind at Lima is firmly established. Since there is no ambiguity in the World Encompassed, or among the Spanish witnesses, about the relative time of departure from Lima - "The very next day ... in the morning" - it follows conclusively that the dates given by the World Encompassed in describing the raid at Lima changed at midnight, not noon. This re-establishes a very large problem for anyone proposing that Drake's lost harbor was in the immediate San Francisco area, let alone in sight of the Farallons. It also raises another familiar matter. The above evidence is not from newly uncovered material. Finding it was not so difficult, even for a lone investigator such as this writer. The Drake Navigators Guild was formed in 1949; the claims of freakish date-keeping were made in 1974. Is it reasonable to suppose that this efficient clique remained ignorant of this evidence for the past 47, or at least 22, years? I think not. This investigation has unearthed too many such convenient oversights to be able to consider this one anything other than another intentional deception.